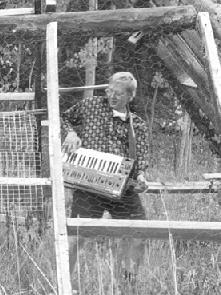 Denver, Colorado based Marcel Peelen's introduction to Kraftwerk and Emerson, Lake, and Palmer in the early 70's planted the seed for his interest in electronic music and subsequent accumulation of an arsenal of equipment (see below). Peelen was born in Amsterdam, Holland to a family of musicians. His father was a professor of music, conductor, concert organist, composer, and choir master, and his mother a soprano soloist. Marcel defines his form of electronica as "a flow of emotions synthesized into musical forms and sounds. I specifically design certain compositions to uplift the human spirit while generating warmth and a sense of well being." To this end, he also conducts research into interactive music therapy, sound colors, healing and whole brain cognitive rehabilitation, and is a Certified Therapeutic Recreation Specialist. The tape begins with "Echoes", a tune that establishes a rapid tribal percussion beat with vibrating synth patterns. A good opening track. You can just picture the cannibals dancing around the cosmic pot of boiling oil. "In Sync" heads into more floating electronica territory, though Marcel is quicker to develop his main themes than many such artists. That is, there is little build up and multiple competing melody lines are introduced early (i.e., things get interesting real quick). All this is played against an electronic windstorm that provides the foundation for Marcel's explorations. TH #27" has a strong Tangerine Dream sound though I was also reminded in parts of some of Goblin's soundtrack work. Well... there was one bit that brought to mind Suspiria. "Opus" ends side one and is very much like a classical electronic symphony. It has lots of great percussive sounds, creates a majestic atmosphere, and has a melody that grabbed me more than any on the tape. Side two begins with the 15 minute aptly titled "Sonar". I liked this track because it combined several different layers of sound, atmosphere, and electronic instrumentation. Out of one speaker comes the fast paced, almost techno percussion beat. From the other is an assault of cosmic sounds that could well be from an underwater voyage, an aural journey into the ocean's depths. The tension builds throughout the track as the percussion and freaky synth sounds duel with one another. "Sequence E-7 is one of my favorite tracks and is truly the most cosmic experience for spacerockers here. Marcel still travels down a Tangerine Dream influenced path but the music is much busier and the sounds far freakier than most electronic works. There is so much going on that it's difficult to keep, but the ride is a smooth one and well worth the effort. The closing track, "Birthsong", is a more symphonic piece and perhaps the closest to revealing his Keith Emerson influence. AI: Is Fantasart(TM) solely a vehicle for your electronic music or does it encompass other artists or projects as well? MP: Fantasart (TM) does not incorporate other artists. This trademark began when I was making pen-and-ink fantasy art (hence the name-- my art is borne of fantasy--) - I did (and still occasionally do) this for 28 years. I've been published in Rolling Stone and High Times in the early 70's, and in Acme Comix twice in '82. After I took up keyboards my visual art took a back seat. I use the trademark for my audio art, my cassette covers, and I still do collages and electronic sculptures. AI: Is Random Noise Generation your first release or is there a discography to speak of? AI: It's interesting that you cite Tangerine Dream and Kraftwerk among your primary influences as I found elements of both in your music. The floating dreaminess of Tangerine Dream as well as the pre-techno quirkiness of Kraftwerk. MP: Actually Keith Emerson is my BIGGEST influence and mentor - I've had the honor of meeting him and the band twice. Other influences include The Orb, Laurie Anderson, and other techno, rave, avant-garde, and improvisational artists. AI: Your parents have an impressive musical background. Are you also a trained musician? MP: No I'm not trained in the classical sense of the word - I believe in "genetic memory" - my father and his brother were both famous in Holland. I taught myself to play the synthesizers. I also taught myself additive synthesis and later applied these methods to analog synthesis and programming my own sounds. AI: Have you always been a solo musician or have you been in band situations? Would you be interested in doing this type of music in a full band setting? AI: Your equipment list is extensive to say the least. Is all of this incorporated into the music on Random Noise Generation or were just certain portions deemed appropriate in this case? 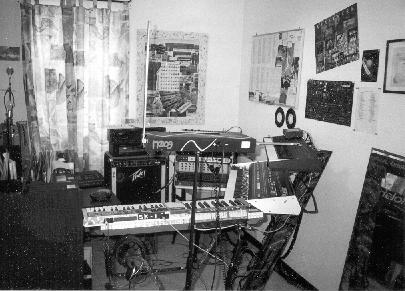 MP: I used all the equipment listed on the "Random Noise Generation" tape - all live to tape - no overdubbing -- the last cut on side 2 was written on my Opcode's Vision software. I don't think every song included all pieces of equipment - but then I don't recall completely. AI: Do you perform live at all? If so, tell me about your performances. MP: I performed live at least once a month before college. Now about 4 times/year and whenever I can (I'm thru with college) - and yes I take ALL my gear (except the computer). Most of the time I do art openings at galleries, local fairs, official city functions, festivals and charitable functions. Sometimes I get paid! I usually end up writing something new for most performances and I also have done three private at-home recitals for friends and fans. AI: Your promo material refers to the availability of video compositions. Tell me about any video projects you've been involved in. MP: I did a (frustrating) video project. I filmed about six of my pieces and did an overdubbed soundtrack to an old "Flash Gordon" movie. AI: Tell me about your research related to interactive music therapy, sound colors, healing and whole brain cognitive rehabilitation. What is a Therapeutic Recreation Specialist? A CTRS is a person who uses recreation as a rehabilitative, social learning and social integration tool for a multitude of diagnosis. It can be used to teach a person meaningful leisure - a depressed person or youth at risk or special needs client can benefit greatly from it. "Special Olympics" is one aspect of TR at work, it can be used for psychiatric clients, and also we teach arts & crafts courses at your local recreation center. AI: Any final news items or future plans you'd like to share? MP: Final news - performing live at a Metaphysical Fair for the third time here in Denver. Future plans - I'd love to either build or buy an Ondes Martenot, modular synth and bizarre MIDI interfaces. I'm always on the lookout for doing movie (TV or studio) soundtrax - this is my dream. In the meantime I need to update my computer end of the studio (my MAC is a six year old dinosaur), would like to get to the point of being able to produce CD's at home and am currently working on a project with a local rave culture DJ! You can visit Marcel Peelen at his web site. There are also sound files available at his mp3.com web site.